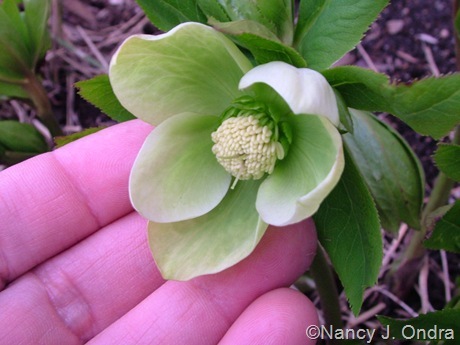 Back in my March Bloom Day post, I made a comment about loving all of my hybrid hellebores (Helleborus x hybridus). At the time, I meant it. But now that they’ve been in bloom for a few weeks, I find myself qualifying that statement frequently. Some clumps I visit daily or even more often, even if I have to go out of my way a bit. Others I walk past multiple times a day and seldom notice. And still others make me wish I had a shovel in hand so I could end their (and my) misery. Noticing the differing amounts of attention I give each clump inspired me to come up with a simple three-level rating system for the Hayfield hellebores. 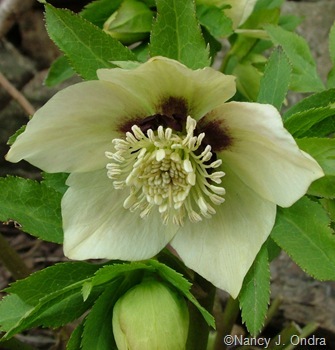 A particular hellebore may be exceptional (good enough to take with me if I ever had to move again, and possibly even good enough for breeding stock); or mediocre (I like it but wouldn’t lose sleep over it if it died); or plain old ugly (I wouldn’t even give it away). Pondering this made me start wondering which specific traits made certain hybrid hellebores outstanding and others also-rans. The result of that wondering was a rather extensive list of features, some of which are immediately obvious and others I hadn’t really put into words before. Now, if you’re still at the “every hellebore is a good hellebore,” stage, that’s terrific: They’re lovely plants, and I’d be sorry to make you like your own plants less if they don’t match what I personally value in mine. 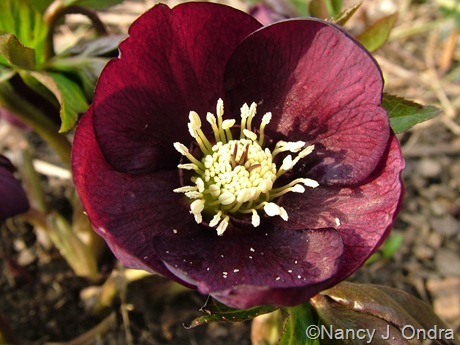 But if you’ve been getting a bit “hellebored” with your hellebores and are looking to thin out your collection and/or acquire some possibly better plants, then perhaps some of these points will give you some standards to consider. 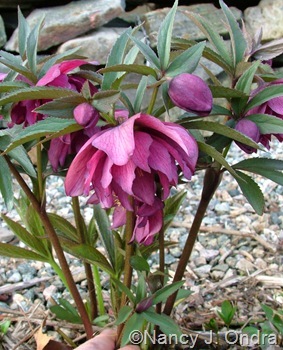 Hybrid hellebores typically bear nodding blooms, as shown above. Sometimes they’re distinctly bell-like from the time they open through seed formation; sometimes they’re consistently tilted slightly downward; and sometimes they start out downward-facing and turn outward or even upward as they mature. To my mind, the averted faces are a charming feature: You can either admire them from a distance or take the time to approach, bend down, and gently tilt them upward to admire their otherwise hidden features. 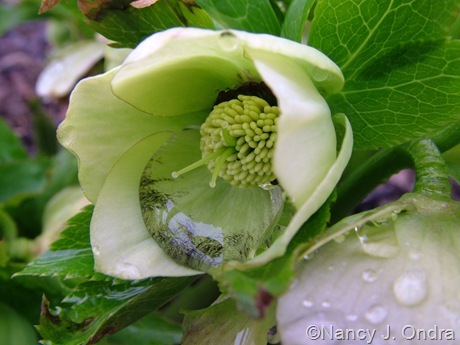 True, the ground is often cold and damp during hellebore bloom season, so kneeling in the mud isn’t always the most fun thing to do. The experience of interacting with the blooms and seeing beauty that you might otherwise have missed can be worth a good amount of physical discomfort, though. I’ve heard a lot of rumblings about people wanting hellebore flowers to face distinctly upward. I’m not sure whether these nameless people are gardeners, or plant breeders, or marketing folks, or photographers. I can certainly understand the advantage to photographers, and being able to tout a “new and improved” feature makes it a whole lot easier to write zippy catalog copy. And from a breeding perspective, it gives something different to shoot for, I suppose. I’m not sure I get why a gardener would find outward- or upward-facing blooms (as shown above) a major improvement. Is it because they don’t have to get down and touch the flowers? That saves a few seconds of time, I guess, and it’s a bit easier on creaky joints. There are plenty of other spring flowers with easily visible blooms, though. 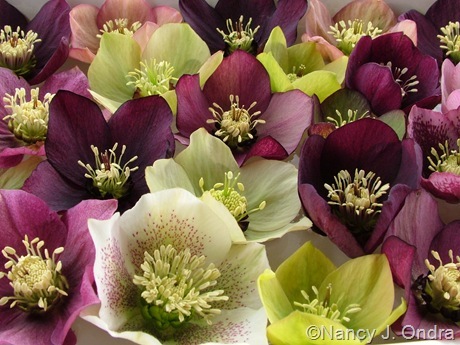 Why do we need to make hellebores more ordinary? I’ve heard that there’s a practical advantage to the blooms facing downward: it protects their pollen from rain. While that wouldn’t matter much to gardeners, I imagine it’s an advantage from a breeding perspective. Here’s a distinctly cupped, outward-facing bloom doing what cups do: holding a relatively large amount of water. It’s easy to see that might be a problem if the pollen were ready to be released, and it seems like it could encourage disease problems as well. I haven’t heard any proof of that, however; it’s just conjecture on my part. My vote: If haven’t yet guessed, I give the nod to nodding blooms. I don’t have any good reason to dislike the outward- or upward-facing ones, except that they’re getting trendy and that annoys me on general principle. To my mind, the exact form isn’t as important as having evenly shaped sepals that overlap nicely. I’ve noticed that sharply pointed sepals often twist a bit, so there are distinct gaps between them, and that makes the appearance less pleasing, in my opinion. Then, there are the double-flowered hybrid hellebores. After seeing one at a nursery recently and deciding I didn’t like it, I was stunned to find out that I actually have some in my garden. I know I didn’t buy them, but I do remember that a seed strain I acquired years ago was supposed to have some double genes in it, so I guess that’s where they came from. I understand the allure of having something different, but you know, it just doesn’t look like a hellebore. 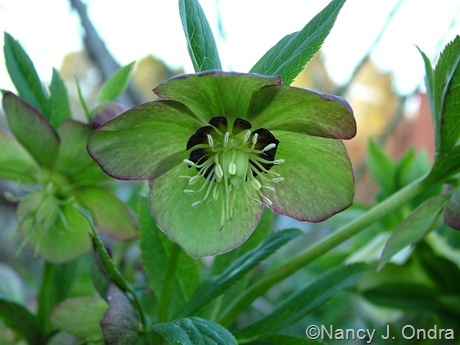 I could describe the flowers as quirky, or whimsical, or shaggy-looking, I suppose, but not elegant, which is the adjective that often comes to mind when I look at my favorite hellebore blooms. My vote: As far as single blooms are concerned, I’m open to those with starry outlines if they have other good features, but my preference is for those with gently scalloped to circular outlines and overlapping sepals with no gaps. And doubles? Well, as I said, I wouldn’t buy one (or rather, invest in one, considering their usual price range), but I’m not about to shovel-prune mine either. I’ll wait a few years to pass judgment on whether they’re worthy of using for breeding. Had enough for now? Me too. 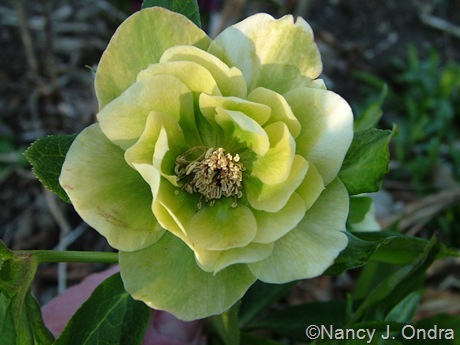 I think I’ll stop here and finish this in another post (Building the Perfect Hybrid Hellebore – Part 2). Can’t wait for the continuation. We brought our first hellebore home this spring. Neither rain nor mud has stopped us from getting down on the ground to admire it. Good for you! I hope it is the first of many. 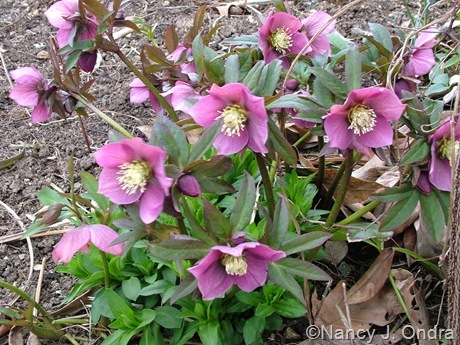 Among the very first plants I set out when I started gardening at my parents’ farm were three hybrid hellebores. Over 20 years later, they’re still going strong! Hear, hear, Nan! (Though yikes, those ghastly doubles.) I confess a fondness for starry singles myself. One of the delights of hellebore season, in my view, is turning up the blooms to see (or rediscover) what they look like face-up. It’s often unpredictable and can be unpredictably delightful, as a ho-hum plant reveals a gorgeous pattern or color combination. At this time of year, we need all the little garden thrills we can get! 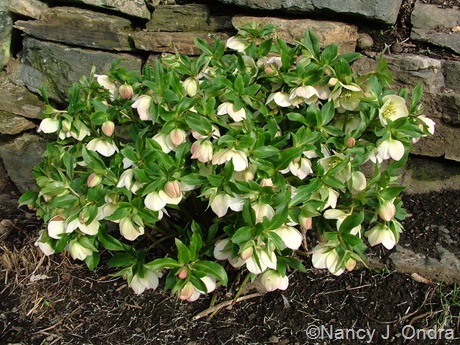 Now, here’s a question: When I was recently in North Carolina, I noticed that the hybrid hellebores there had bazillion more flowers and quite a different form (plant, not flower) from mine here in PA: very dense and rather startlingly pincushiony. Is that climatic, or is it a result of (ahem) fertilization? 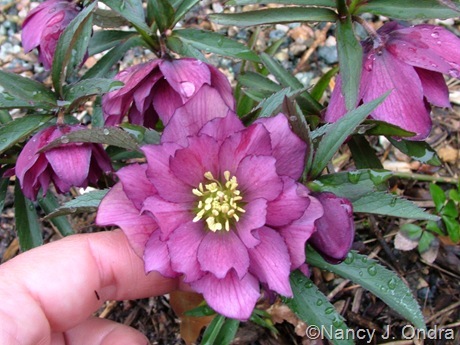 I was very struck by it; if I hadn’t known hellebores, I’m not sure I would have recognized them as the same plants. I don’t know the answer to your question, Elly, but I’m sure Cole would be able to tell you why they appear so different. 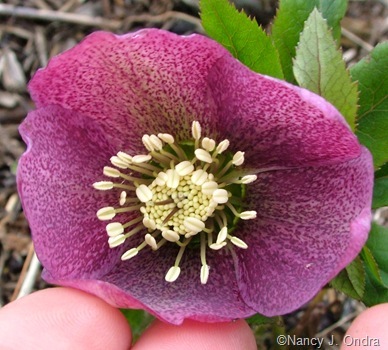 A lot of useful info about the hellebores. How do they come to have the different petal shapes? Some here are pointy, some round, but they have inter bred so much, it is hard to keep track anymore, but all are welcome and none would be tossed. They grow so well and look good all year and are perfect for our difficult hill, all are welcome. I’d guess that the range of petal shapes, not to mention all of the other varying characteristics, is due to the range of species that have contributed traits to the hybrids. And I can easily imagine that the plants show off perfectly on your sloping site, regardless of their flower forms. Hi Nan, you can put me down for nodding starry blooms. The colors you have are magnificent! Thanks for your vote, Melanie. Just wait – the color part is coming soon. Still no hellebores in our landscape. I’ve thought about them from time to time, just never picked any up. How many different varieties do you have? Well, you have so many other projects going now that I’m not surprised you haven’t gotten around to hellebores, but I hope you try them at some point. If you run across small plants at a fair price, pick up a few, and set them out them somewhere; a few years from now, you’ll be glad you did. None of my plants are named cultivars, but overall, I’d guess I have about 30 plants here, and probably that many or more at my parents’ place around the corner. If you hear plants speaking to you, then what else can you do but bring them home, so they don’t start conversing with less trustworty people? Thanks for the photography tip. You know, H. niger is one plant I simply can’t grow, and I’ve really tried. I give my vote to the nodding blooms too. I love to turn their smiling, sometimes freckled, faces upwards to see what surprise they hold in store for me. BTW I’m allergic to the word trendy! Niger doesn’t grow for me either Nan. I’ve tried it a few times but it always flowers for one season and is gone, dead and buried, the next. 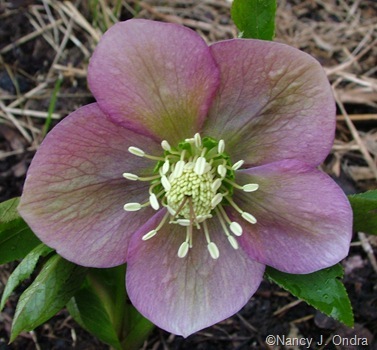 What prices do you have to pay for hellebores? Here they range from 3 to 15 euro, with 15 euro being the exception rather than the rule. Earlier this year I bought 5 hellebores for 3 euro/ 4.50 USD each. It’s been a good while since I’ve bought any hybrid hellebore plants, but I think they might go for around that price in 4-inch-square pots. I had a weak moment today and bought one more H. niger to try (I had to, because it had a bit of variegation in the foliage): It was in a 6-inch-square pot and was $8.99 USD, plus tax. I know, it was probably a waste of money. I may as well have dug a hole and buried a $10 bill. I’m with you on the doubles. One thing that really irks me is when you take a perfectly beautiful flower and make it double… and it ends up looking like something else. For example, doesn’t your upturned double look like a double clematis? I admit that I really like the light green colored flowers, though. Maybe I wouldn’t be as thrilled about them in the summer, but I really like them in the spring. You’re absolutely right, Kim: It looks just like a clematis. And I must confess that I’ve weakened my stance on the green ones: They do have a fresh look that’s quite pretty when combined with some of the other colors. You have so many beauties there! I hope your hellebore made it, Kerri, but if not, do try again. They’re worth it!